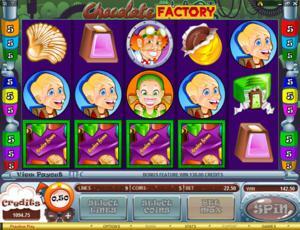 Chocolate Factory is an online video slot machine game released in September 2006. It is offered exclusively at online casinos powered by Microgaming. This online video slot game has 5 reels and 9 pay lines. The theme of Chocolate Factory is inspired by the children’s books written by Roald Dahl which was later turned into films entitled Charlie and the Chocolate Factory. Enter a world where only chocolate, fun, and great prizes matters with the Chocolate Factory online slot machine game, and you don’t even need a Golden Ticket to enter this factory! When the slot game loads, you’ll be introduced to Doctor Chocolate and 2 children named Candy and Mikey, and you get to see some delicious chocolate inventions presented to you in a swirling vortex of chocolatey goodness! Chocolate Factory is an online slot game suited for all levels of players, from beginner to expert. Many claim that the Chocolate Factory video slot game is not only a gold mine for avid slots lovers, but it is also a great game to play at if you have a passion for chocolate perfection! Microgaming online slot games are accessible to players in 2 formats – download and no-download. Most people typically prefer to download software because they can enjoy Microgaming’s entire list of online slot games in one download only, while there are those who would like to play instantly so that they can find out if a certain slot game is fun and exciting enough to spend their precious time and real money with. Whether you like to download their software first or you prefer to play instantly without the need to download, then Microgaming surely has slot games to cater to your specific slot gaming standards. Chocolate Factory belongs to the download category of Microgaming slot games, which means you must download it first before you can play the game. Chocolate Factory is created for players who not only love chocolate, but also love to play entertainingly rewarding online slot machine games. The Chocolate Factory online video slot game features scatter wins, a wild symbol, 2 fun Bonus Feature games (Bonbon Bonus Feature game and the Dunk-a-Treat Bonus Feature game), a maximum coin jackpot of 40,000, and a maximum cash jackpot of $40,000! The graphics and sound quality that Microgaming provides is absolutely excellent and top notch. They have an outstanding reputation of making the most dazzling graphics and splendid sound effects that will truly transport you to “that specific theme” they use in any of their slot games. Most people love to play games run by Microgaming software because they have smooth animation and engaging yet non-interfering sounds. In Chocolate Factory, you will be taken to a huge factory where many of the innovative and best-tasting chocolates you’ve never seen before are manufactured! Chocolate Factory, overall, exudes a jovial atmosphere as you can see it in their colorful symbols and the design of the reels. All symbols are simply animated when they are included in winning combinations, and the backdrop of the reels is a solid purple so you will definitely not strain your eyes when you play this game for a long time. The overall graphic design of Chocolate Factory shows the inside workings of the factory itself (behind the reels). The line indicators are even creatively designed to match the theme, as it looks like they are pipes ready to squirt out chocolate and other scrumptious fillings on the bonbons the factory is making. The colors used in the Chocolate Factory online slot game include red, blue, green, yellow, black, white, orange, pink, gold, purple, and of course, brown. When you spin the reels, the sound resembles the one you will hear at real land-based casinos, accompanied by bubbling sounds (of chocolate, maybe?) as well as tinkling sounds. Tinkling sounds will be heard when you form winning combinations. Joyous, circus-type background music is programmed when you are playing the Bonbon Bonus Feature game. There are no card deck symbols available in the Chocolate Factory online video slot game. The regular symbols that you will find in Chocolate Factory are the Mint Wedge, Praline Shell, Turkish Delight, Chocolate Coin, Hazelnut, Cherry Cream, and two children named Candy and Mikey. The Wild Symbol is the Doctor Chocolate symbol. The Doctor Chocolate wild symbol acts as a substitute for other symbols (except for the 2 Scatter symbols) in order to help you form winning combinations. The Doctor Chocolate wild symbol can only substitute for the “chocolate-covered candies” symbols. You are paid varying prize amounts (refer to the Payout table) when you manage to form a winning combination with multiple Doctor Chocolate wild symbols on an enabled pay line. There are 3 Scatter Symbols in the Chocolate Factory online slot game: the Confectioner, Bonbon Box, and the Dunk-a-Treat symbols. The Confectioner scatter symbols are not required to appear in a line (on an enabled pay line) for you to win. • Confectioner scatter symbol – Appears anywhere on the 5 reels. You are paid scatter awards as long as you get 2 or more Confectioner scatter symbols to come out anywhere on the 5 reels on an active pay line (in a winning combination). Your winnings are calculated by multiplying the Confectioner scatter symbol combination payout (refer to Payout table) by the total number of coins you’ve bet. Please take note that if you get a scatter win and a regular win, then you are paid out for both of these wins, because the Confectioner scatter symbol is not required to come out on an enabled pay line for you to win. Scatter awards are independent from pay line awards, and are added to the pay line win. • Bonbon Box scatter symbol – Appears anywhere on the 5 reels. When you get 3 or more Bonbon Box scatter symbols to appear on an enabled pay line in consecutive order, you will activate the Bonbon Bonus Feature game. • Dunk-a-Treat scatter symbol – Appears anywhere on the 5 reels. When you get 3 or more Dunk-a-Treat scatter symbols to appear on an enabled pay line in consecutive order, you will activate the Dunk-a-Treat Bonus Feature game. Please take note that the Bonbon Box and the Dunk-a-Treat scatter symbols will not give out any winnings; however, they are your ticket to enter and play their respective Bonus Feature games. If 3 or more Bonbon Box scatter symbols come out on an active pay line in consecutive order, you will trigger the Bonbon Bonus Feature game. There’s no payout for all Bonbon Box scatter symbol combinations. In the Bonbon Bonus Feature game, there will be 10 chocolate-covered candies presented to you. Within each of these candies, there is a random bonus prize or a “Collect” sign. The aim of the Bonbon Bonus Feature game is to select as many candies with hidden bonus prizes as you can, before you get to reveal a Collect sign. Once the Collect sign is selected, the Bonbon Bonus Feature game will end, and the remaining Bonbon candies will be shown to reveal their hidden bonus prizes, and then the consolation win amount is calculated. The consolation win amount you will get is based upon the values contained within the Bonbon candies. You can win up to 4,375 coins in this bonus game. When the Bonbon Bonus Feature game is over, you will be then taken back to the main Chocolate Factory online slot game, and your winnings from the bonus game will be included to your overall balance. If 3 or more Dunk-a-Treat scatter symbols appear on an active pay line in consecutive order, you will activate the Dunk-a-Treat Bonus Feature game. There’s no payout for all Dunk-a-Treat scatter symbol combinations. In the Dunk-a-Treat Bonus Feature game, there are 5 Treats presented to you which contain a random bonus prize amount. You are to select a Treat to unveil the random bonus prize you will win. You can win up to 2,500 coins in this bonus game. When the Dunk-a-Treat Bonus Feature game is over, you will be then taken back to the main Chocolate Factory online slot game, and your winnings from the bonus game will be included to your overall balance. Chocolate Factory has 5 reels where you may bet on 9 pay lines. The minimum bet is 0.01 and the maximum bet is 1.00 per pay line. You can wager 1 up to 5 coins per pay line bet. Therefore, the maximum bet amount is 45.00 per spin. Please take note that the amounts mentioned are in Pounds, but they will remain the same if you choose to play in US dollars, Euros, or Canadian dollars. Also, for every coin that you wager, you will enable another pay line. You will be paid out for winning combinations on enabled pay lines only. The maximum payout in the regular Chocolate Factory online video slot game is 8,000 coins per line bet. Those who regularly play online casino games obviously love to stay longer and play on online slot games that have an Autoplay function. Good thing that Chocolate Factory is furnished with this function! In Microgaming online slot games, they have 2 game modes – Regular mode and Expert mode. You can have the game spin automatically for you with the Autoplay function that can be found by clicking the Expert button (if you look closely at the brown line at the bottommost part of the game screen, you will see the Expert button just below the Bet Max button). After customizing the Autoplay function to your preferences, just click on the Start button, and the game will automatically spin for you while you just sit back, relax, and enjoy playing this chocolatey-filled online video slot game!